On Friday I reviewed 4 out of 5 pieces from my Stitch Fix box #18. 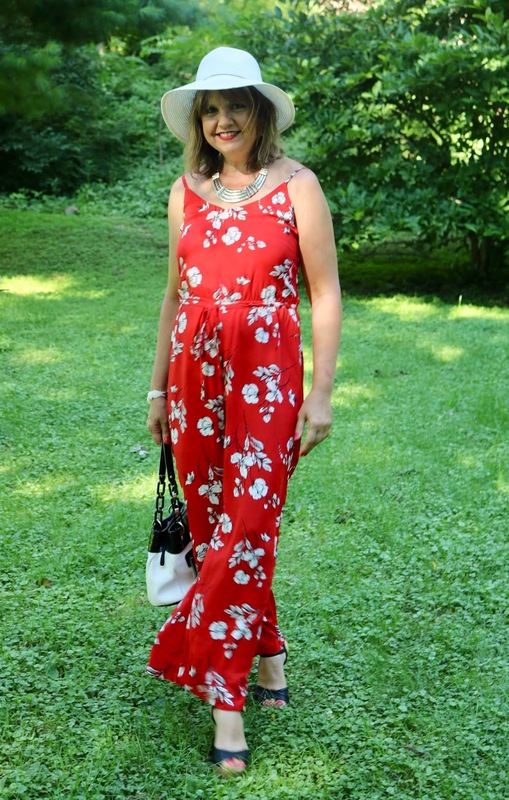 I saved one piece, this jumpsuit, to review for today so I could show you lots of pictures! I have been seeing jumpsuits in Blog Land and in stores and have been curious to try one on to see what I would look like in one. So I asked my stylist to send me a jumpsuit, and she did! I was thrilled to see this pretty red jumpsuit in my box. The jumpsuit is by Skies Are Blue and is called "Danica Jumpsuit". 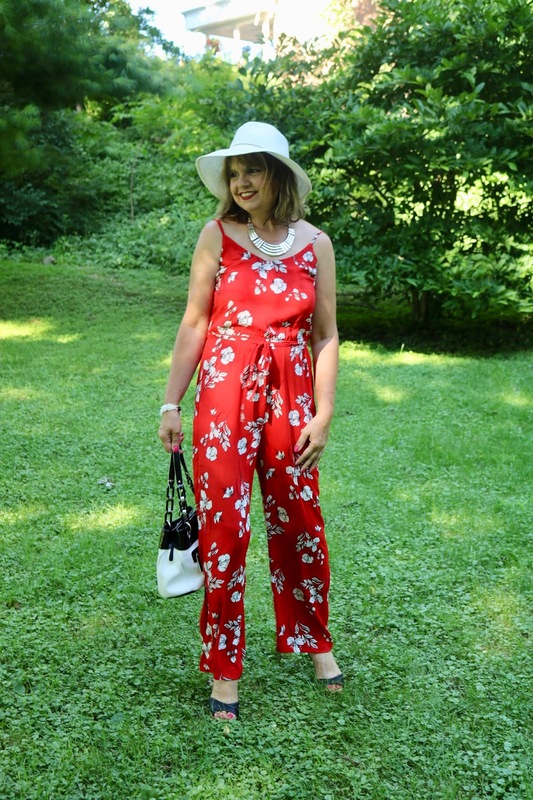 There were many things about this jumpsuit I loved: the cherry red fabric, the white floral print, the wide pant leg, and the soft, flowing fabric. What I didn't love? The spaghetti straps and the lack of waist definition. It did nothing for my thick waist. I would have preferred a jumpsuit with more of a shoulder strap or sleeves, and something with more waist definition like a wrap, a ruching, or even a wider belt. The back of the jumpsuit was gathered with elastic so there was plenty of give making it very comfortable to wear. I did not think the jumpsuit was very attractive from behind. I also didn't like how exposed my upper back was with just the spaghetti straps. I'd like to try a jumpsuit that keeps my back more covered up. It was a fun piece to style. 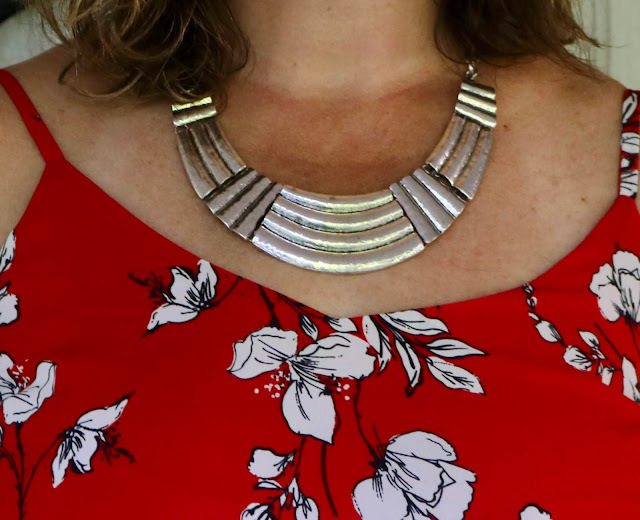 I accessorized with this large, dramatic silver necklace my husband bought for me at a gift shop in Stockholm, Minnesota. 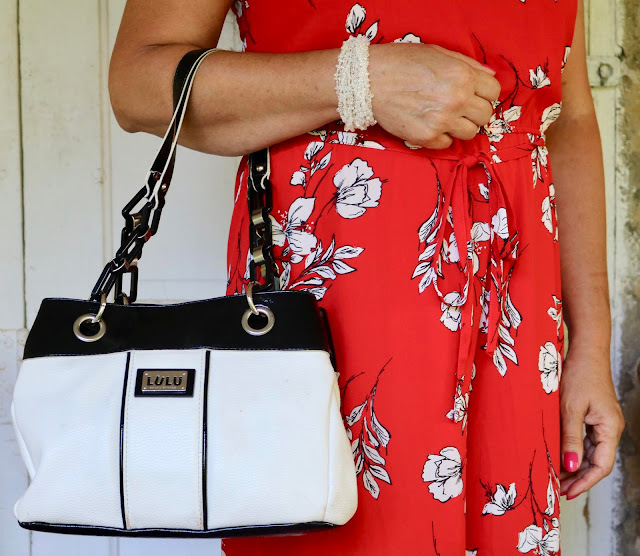 I picked out the white and black in the print and wore a white bracelet and hat and carried a white and black handbag. The finishing touch for a fun jumpsuit were these funky high-heeled cork sandals. I really liked this jumpsuit, but in the end I returned it because I didn't think I'd get a lot of use out of it with the bare shoulders/over-exposed back. I would like to try another jumpsuit that offers more coverage. My stylist recommended wearing a denim jacket or cardigan with it, but if it's that cold to need those pieces, I wouldn't be wearing the jumpsuit. In summary, I'm glad I asked for a jumpsuit in my Fix, but this wasn't the right one for me. I am very open to trying another one in a different style that would be more flattering for my body type and provide more coverage. Such a cute look and super styling, Amy. But you are so right, the desire for a jumpsuit obviates the need for a cardi. So well done you for taking the sensible route of returning it. Have a blessed week, x. Thanks Patti! I definitely would have kept it had it more coverage. Thanks. That sounds like way too much work Jodie. I'll just keep my eye out for a different one. Or maybe I'll get lucky and Stitch Fix will send me one I like. This looks amazing on you! So stylish! But it's understandable why you sent it back...I too would not like to expose so much of my back. thanks so much Ellie! It's good to know someone else feels the same way. I love this pretty red print- and it would be super cute with a cardigan or a denim jacket! Definitely! My stylist suggested that too. It's a gorgeous jumpsuit, I love the colour. What a shame it wasn't quite right. Fingers crossed you find the perfect one. Thanks for linking up! Ohhh to bad, I think you should have kept this. I love the jumpsuit. I wore a very similar blue+white floral cropped culotte jumpsuit yesterday on our vacation, also paired with a floppy hat. So I smiled when I saw this outfit. You look great and styled this very well, exactly how I styled mine. Thank you. I did like it, but it wasn't quite right. I'll keep my eye out for one more appropriate for me or maybe Stitch Fix will send me another one. Love your outfit Amy! The jumpsuit looked great on you. I am so attracted to red, it is my favorite. Maybe wear a thin tee under or a white denim jacket over it if you are looking to cover your back. Oh a thin tee is a great idea. I didn't think of that! I seriously have so much trouble with jumpsuits because I'm super short waisted and thick through the hips. I think this looked great on you though lady but completely understand returning if you didnt' feel like a million. I have the opposite body type as you: long waisted and small in the hips but heavy on top. I think jumpsuits would work for me if I had one with more coverage on top. You look stunning in this suit! Thanks for joining the Top of the World Style linkup and sharing the look. Two of my favorite things, a jumpsuit and florals! Love this look, the red looks beautiful on you Amy! I love the jumpsuit! Especially with the white hat. I would have said keep it, but if you wanted more coverage it's a good thing you returned. I've bought too many things where the fit was iffy and I excused it just to not wear it. Still, maybe you can find something similar that works a bit better! It looks great on you. Thanks Mary. I was shopping a bit this weekend and saw jumpsuits with more coverage on top. I didn't have time to try any on though. I think that would be a better option for me. I love the color dear, so vibrant and full of life. So perfect on you! I think you might be a bit hard on yourself, Amy. I like how you look in this jumpsuit. I love jumpsuits and I like this red one you styled. I know jumpsuits are hard to wear at times especially the ones without elasticized waist or self tie belts. I do love how this jumpsuit looked on you but I can also understand making sure that it works for you overall. Thanks Maureen! I receive a lot of Stitch Fix items that I'm not sure about, so I send them back, and later regret it. This might be one of those items. I really did like it, but I just wanted one with a bit more coverage in the back and arms. I tried a jean jacket over it like the stylist suggested, and I didn't think it looked good.